Finding a substitute for your desktop computer or a laptop? The iPad Pro 10.5 inch is the perfect replacement! With all the functionalities and features that a laptop provides you, iPad Pro does not lack behind anymore. What you need to do is just pair up your iPad with the smart keyboard that is nowadays handy in the market. For these smart keyboards, we have covered up some of the best iPad Pro 10.5-inch Keyboard Cases that will protect your keyboard when you carry it along with your iPad. The top-rated keyboard cases for iPad Pro 10.5 inch are portable in design. Hence it goes perfectly with your iPad Pro. These keyboard cases not only provide you comfortable typing but also provide overall protection to your iPad Pro from unwanted drops and accidental bumps. You can even utilize the stand feature to get the best typing as well as viewing angle. Get a smooth sailing like typing experience! Doesn’t this sound quite interesting? As the safety of iPad is important so is the safety of its Smart Keyboard!! Let’s take a quick look at some of the cool iPad Pro keyboard cases from the below list! The Smart Keyboard from Apple is just a level up as compared to all other keyboards available. It’s a full-sized keyboard which offers you the best typing experience. Its portable nature enables you to carry it wherever you go. What you need to do is just connect the keyboard to your 10.5 inch iPad Pro with the help of smart connector and start typing! When you have finished your work, just fold the keyboard to create a slim, portable and lightweight cover. The ZAGG rugged case not only protects your iPad’s screen but also saves it from certain drops and edge damages. Its multi-layer build quality can hold out drop from a height of 6 feet. A dependable case for your iPad to carry out everyday work. The keyboard can be connected to two different devices at the same time. You can toggle between any of those devices after connecting them with Bluetooth. The stand lets you adjust the tilt of the screen for an appropriate viewing angle. This multifunctional keyboard case comes with a sleek and stylish design which gives your iPad Pro a premium look. The case is made of advanced aluminum alloy; this case is heavy and yet acts as armor against certain bumps and drops to keep your device safe. The keyboard has a Bluetooth connectivity interface and needs to be charged with a USB cable. On a single charge, it can last up to 30 days in standby mode. It also features an auto sleep/wake function where the keyboard goes into sleep mode when closed and vice versa. With seven different backlight color options and three adjustable brightness modes, you can set a suitable theme to suit your work mood. A protective case for iPad Pro if it plays a major role in your daily life. The muscular body of the keyboard case is made of aluminum alloy and resistant to subtle drops and bumps on hard surfaces. The keyboard draws power from a USB source, directly to its rechargeable battery. Its silent typing experience is similar as compared to that of MacBook with a super slim design. The keyboard features seven distinct backlit colors to choose from with three different adjustment level for brightness. You can rotate the iPad up to 135 degrees for the comfortable viewing experience. A slim wireless Bluetooth keyboard which completes your iPad Pro as a laptop and acts as a case to protect its screen. This keyboard connects to your iPad automatically when turned on and goes to sleep mode if the device is left stationary. On a single charge, it can serve up to 100 hours approximately. The Protective case has elevated rubber strips on its side to protect the screen from scratches when flipped. It also features seven different types of LED backlight color and the option for adjusting brightness. 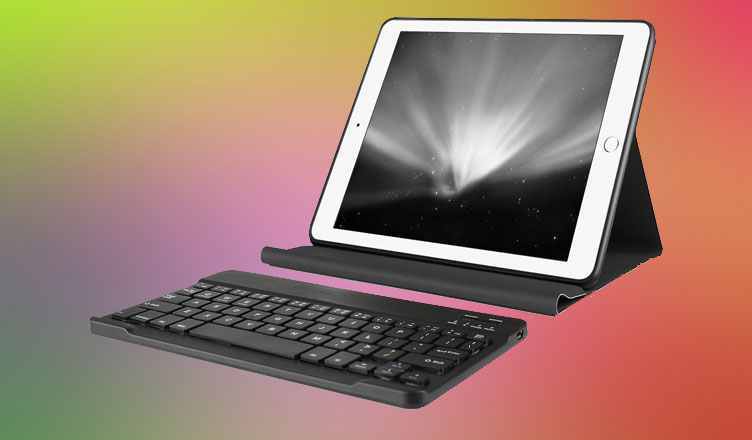 The Lenrich smart keyboard has a Bluetooth interface to connect to your iPad Pro. The keypad is sturdy and provides great precision in all sorts of typing work, be it blogging, copywriting or article writing. The battery is built to last a more than a day with rigorous use. The case consists of a shaft bracket where you slide your iPad in, and it will act as a 360-degree rotatable stand. It also offers multi-angle adjustment for proper viewing angles. A lightweight, leather covered, magnetically detachable keyboard which adds protection to your iPad Pro’s screen and protects it from soft bumps and drops. The case acts as an adjustable stand for your iPad to provide a suitable viewing angle. The keyboard when left idle, automatically goes to sleep mode to save energy. The keys are made of sturdy ABS material to last infinite number of strokes and have a tactile response which gives you the ability to type faster with full accuracy. An appealing yet simple keyboard case for your iPad Pro to match with its contrast. It is made of PU leather on the outside and soft, microfiber interior with magnetic closure to protect your screen from scratches and the saves the body against certain falls and bumps. The keyboard is easy to set up and lightweight to carry around in your bag if you love to keep it with you wherever you travel. The built-in rechargeable battery can provide 75 hours of productivity with 2 hours of charging time. You need to connect it to your iPad via the Bluetooth interface which has an effective operating distance of up to 33 feet. The adjustable stand lets you alter the screen tilt for a comfortable viewing angle. The 10.5 inch iPad Pro keyboard cases and covers from PASONOMI are specially designed with precise cutouts to fit your 10.5 inch iPad Pro. This tactile Bluetooth keyboard offers you better performance with its optimized keys. Moreover, it delivers wireless functioning so that you can remove it when not needed. Made from premium quality of PU leather, it gives an extremely classy look to your iPad. The case can be folded and adjusted to multiple angles as per your convenience. You can keep your iPad in landscape position with the help of stand to get better typing experience. The iPad Pro 10.5-inch keyboard case from IVSO is a portfolio type of case. It is light in weight and hence can be carried wherever you want. This case with precise openings at the ports and buttons provides all-round protection to your iPad as well as its keyboard. You can even place the Apple Pencil in the case. The keyboard is equipped with 250mAh Lithium-ion battery which lasts for about 90 hours. This keyboard works on dormancy function i.e. if you don’t use it for 5 minutes then it automatically slips into sleep mode to save the battery. KuGi brings to you the keyboard cases for iPad Pro 10.5-inch. It is made up of durable PU leather; hence making it last for a long time. This smart keyboard accelerates your typing speed as compared to other conventional keyboards. It is a detachable Bluetooth V3.0 keyboard that works seamlessly with your iPad Pro 10.5 inch. The magnetic closure of the case ensures safety to your iPad. You can fold the case to use it as a stand and even adjust angles to get the best viewing experience. The magnetic removable keyboard design enables you to conveniently use it as well as carry it along with you wherever you want. Being a luxury in itself, the iPad Pro 10.5 inch deserves all the protection you can provide. To know about the other accessories available in the market for iPad Pro 10.5 inch, you can refer to our below-mentioned articles. Which of the above listed some of the best Keyboard Cases for iPad Pro 10.5-inch would you like to have for your latest iPad? Do share your choices and views with us in the comments section. © The content is copyrighted and may not be reproduced without permission.